In general, heritage refers to the inheritance – both physical and intangible – bequeathed on the present by the past. Beneath this straightforward understanding, however, lies myriad implications and complications, particularly in the present age of globalised interests and diverse nation-states. While there is little dispute about the overall value of heritage in providing a window of knowledge to the past, that value is usually complicated by questions of ownership, the costs of recovery and preservation/conservation. Such questions raise further issues, including the tussle between tradition and development, the ethics and legalities surrounding heritage recovery and conservation, and engagement between the state and civil society. Such issues were ever-present in the recent Belitung shipwreck controversy as well as in the ongoing debate over the future of Bukit Brown Cemetery. The manner in which Singapore has approached these two heritage issues and others has significant implications and consequences for how Singapore determines the value of its heritage, or, indeed, how heritage is defined in Singapore in the first place. What are the considerations and concerns involved in making such decisions? How far is Singapore willing to go to preserve or to conserve heritage? To address those questions and to raise public awareness of such issues, the Singapore Heritage Society and the School of Law, Singapore Management University, bring together a distinguished panel of professionals to share their expertise and to reflect on their experiences working in particular areas of Singapore’s heritage. 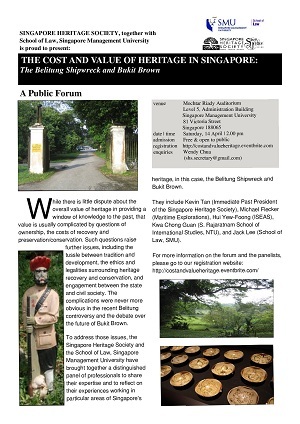 This event is free and open to the public, and will be of particular interest to heritage professionals, enthusiasts with an active interest in Singapore’s heritage, students of law, history and heritage, as well as members of the public wanting to know more about how Singapore deals with its past and inheritance. Dr Michael Flecker is Managing Director, Maritime Explorations. Michael has 25 years of experience in surveying for and archaeologically excavating ancient shipwrecks. His speciality is ancient Asian ship construction. He earned his Ph.D. from the Southeast Asian Studies Department of the National University of Singapore based on his excavation of the 10th century Intan Wreck in Indonesia. This thesis was published as a book by the British Archaeological Report Series (2002). Other works include the book, Porcelain from the Vung Tau Wreck (2001), contributions to Shipwrecked: Tang Treasures and Monsoon Winds (2010) and Southeast Asian Ceramics: New Light on Old Pottery (2009), and numerous articles in the International Journal of Nautical Archaeology. After graduating with First Class Honours in Civil Engineering from the University of Western Australia in 1983, Michael worked for a Singapore-based engineering company before joining Pacific Sea Resources in 1987. He started off as diving supervisor for the two-year excavation of the 1638 Manila Galleon, Nuestra Senora de la Concepcion, in Saipan. Since then, his company, Maritime Explorations, has directed some of the most important shipwreck excavations in Asia, including the 9th century Belitung Wreck; the 10th century Intan Wreck, the 13th century Java Sea Wreck; the 15th century Bakau Wreck; the c. 1608 Binh Thuan Wreck, and the c. 1690 Vung Tau Wreck. Dr Hui Yew-Foong is a Fellow and Coordinator of the Regional Social and Cultural Studies Programme at the Institute of Southeast Asian Studies. As an anthropologist, his research interests include the Chinese minority in Southeast Asia, religion and politics, and the heritage value of cemeteries. He is the author of Strangers at Home: History and Subjectivity among the Chinese Communities of West Kalimantan, Indonesia (2011). Mr Kwa Chong Guan is a Member of the National Heritage Board and Chairman of its National Archives Board. He is also a member of the Asian Civilisations Museum Board and chairs its Acquisition sub-committee. His association with oral history and museums started in the mid-1980s when he was seconded to reorganise the Oral History Centre and concurrently the old National Museum, which he led through a strategic planning process to expand it to its current three museums and their consolidation under the National Heritage Board. He was also founding Chairman of the Singapore Philatelic Museum and consultant to the Malay Heritage Foundation on the establishment of their museum. More recently, he helped the Singapore Armed Forces plan and develop their Army Museum. He is a founding member of the Singapore Heritage Society. He has also taught history at the National Institute of Education and the National University of Singapore as a member of their adjunct staff. He currently serves as Head of External Programmes at the S. Rajaratnam School of International Studies at the Nanyang Technological University where he is involved in various regional security projects ranging from energy and security to policy analysis for regional security crisis management. Assistant Professor Jack Tsen-Ta Lee has been with the School of Law, SMU, since 2008. His primary areas of teaching and research are constitutional and administrative law, but he has a particular interest in cultural heritage law, having studied the subject when he did his Master of Laws (LLM) at University College London on a British Chevening Scholarship. In January 2012, he successfully completed a Ph.D. on the interpretation and construction of bills of rights at the University of Birmingham, and is awaiting the conferral of the degree. He is a member of the Singapore Academy of Law’s Legal Heritage Committee, and the Law Society’s Public and International Law Committee. Dr Kevin YL Tan is the Immediate Past President of the Singapore Heritage Society and the author of over 27 books and over 50 articles on law, history and politics. He is currently Adjunct Professor at both the Faculty of Law, National University of Singapore and the S Rajaratnam School of International Studies, Nanyang Technological University. In 2012, the Singapore Heritage Society celebrates its twenty-fifth anniversary. The Society is a non-government organisation and a registered charity, dedicated to the preservation, transmission and promotion of Singapore’s history, heritage and identity. The Society has been active in advocacy efforts for many heritage issues in Singapore, such as the development of Chinatown during the early 1990s, the fate of the old National Library at Stamford Road, and currently, the future of Bukit Brown and the former KTM railway land. The Society has, since its inception in 1987, worked and will continue to engage with relevant state agencies and interested individuals and groups to increase awareness and interest in Singapore’s heritage and past. Please visit their website and their Facebook page for more information about the Society and its activities. The School of Law, SMU, accepted its first batch of students in August 2007 and has gone from strength to strength, graduating its pioneer cohort of Bachelor of Laws (LLB) and Juris Doctor (JD) students in 2011. The School’s undergraduate LLB programme aims to produce law graduates who have contextualized legal expertise, the ability to think across disciplines and geographical borders, and to nurture students who are confident, articulate and analytically agile. The School’s full-time graduate programme, called the JD programme, is aimed at those who have a degree in another discipline or a law degree from another jurisdiction who wish to qualify for the legal profession in Singapore. The programme includes the whole of the law content of the LL.B. degree, but is intended to be completed in three (or, with special permission, two) years. 2012 sees the launch of the School’s Master of Laws (LLM) programme, which is designed to meet the growing needs of legal professionals in the region and beyond. Three specialist degrees are offered: the LLM in Commercial Law, LLM in Dispute Resolution, and LLM in Islamic Law and Finance. As alternative dispute resolution gains pace in Asia, Singapore is fast becoming the preferred venue for resolution. Also, being in the heart of the largest Muslim population in the world, Singapore is well-positioned to be in the forefront of innovation and growth in Islamic finance.